The second stage in the process of protein synthesis is initiation. During initiation, all the components necessary for protein synthesis assemble: (1) mRNA; (2) the small and large subunits of the ribosome; (3) a set of three proteins called initiation factors; (4) initiator tRNA with N-formyl-methionine attached (fMet-tRNAfMet); and (5) guanosine triphosphate (GTP). Initiation comprises three major steps. First, mRNA binds to the small subunit of the ribosome. Second, initiator tRNA binds to the mRNA through base pairing between the codon and anticodon. Third, the large ribosome joins the initiation complex. Let's look at each of these steps more closely. A functional ribosome exists as two subunits, the small 30S subunit and the large 50S subunit (in bacterial cells). When not actively translating, the two subunits exist in dynamic equilibrium, in which they are constantly joining and separating (< Figure 15.19). An mRNA molecule can bind to the small ribosome subunit only when the subunits are separate. Initiation factor 3 (IF-3) binds to the small subunit of the ribosome and prevents the large subunit from binding during initiation (see Figure 15.19b). Key sequences on the mRNA required for ribosome binding have been identified in experiments in which the ribosome is allowed to bind to mRNA under conditions that allow initiation but prevent later stages of protein synthesis, thereby stalling the ribosome at the initiation site. After the ribosome has attached to the mRNA in these experiments, ribonuclease is added, which degrades all the mRNA except the region covered by the ribosome. The remaining mRNA can be separated from the ribosome and studied. The sequence covered by the ribosome during initiation is from 30 to 40 nucleotides long and includes the AUG initiation codon. Within the ribosome-binding site is the Shine-Dalgarno consensus sequence (< Figure 15.20) (see Chapter 14), which is complementary to a sequence of nucleotides at the 3' end of 16S rRNA (part of the small subunit of the ribosome). 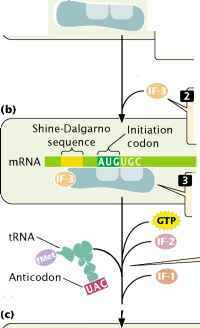 During initiation, the nucleotides in the Shine-Dalgarno sequence pair with their complementary nucleotides in the 16S rRNA, allowing the small subunit of the ribosome to attach to the mRNA and positioning the ribosome directly over the initiation codon. Next, the initiator fMet-tRNAfMet attaches to the initiation codon (see Figure 15.19c). 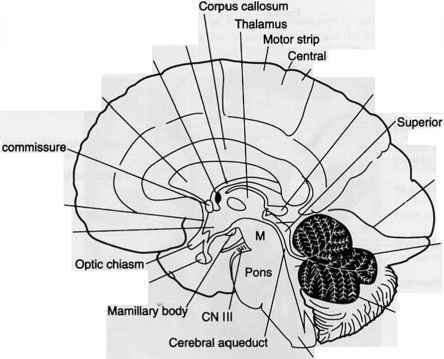 This step requires initiation factor 2 (IF-2), which forms a complex with GTP. A third factor, initiation factor 1 (IF-1), enhances the dissociation of the large and small ribosomal subunits. 'SThe ribosomal subunits exist in dynamic equilibrium, constantly . joining and separating. IF-3 binds to the small subunit of the ribosome, preventing the large subunit from binding,. .which allows the small subunlt of the ribosome to attach to mRNA. ra A tRNA charged with W-formylmethionine forms a complex with IF-2 and GTP. y ra A tRNA charged with W-formylmethionine forms a complex with IF-2 and GTP. and joins the small subunit of the ribosome and the mRNA.